Get cozy with the AMCAS/AACOMAS. These two services – the American Medical Colleges Application Service (AMCAS) and the Association of American Colleges of Osteopathic Medicine Application Service (AACOMAS) – are the primary gateways for future physicians. The Texas medical schools have their own application service – the Texas Medical & Dental Schools Application Service (TMDSAS). You might already be registered for the AMCAS if you’ve taken the MCAT or applied for fee assistance; if not, you should register immediately. Applying to medical school is really expensive – and each program added to your list brings with it a hefty price tag. But don’t let the costs unfairly limit your choices. The AAMC’s Fee Assistance Program and the AACOMAS’s Fee Waiver were designed to defer costs of the applications and the MCAT. You need to be approved before you submit, or you won’t be reimbursed. One of the big decisions you need to make is how many program to apply to. The average applicant submits applications to 14 programs; some submit fewer, while many submit 30 or more. If your GPA and MCAT are above average, then you’re safe targeting a small number of schools, but if in doubt, spread your chances out. To help in your decision, be sure to look at each program’s admission requirements. You can find program demographic information on their websites or compiled together in U.S. News & World Report (but be sure to take such rankings with a grain of salt). If you haven’t yet, go grab your MCAT slot – spring/summer dates are in high demand. And if you require any accommodations, be sure to get your request in early. And if you’re waiting on the MCAT to submit your application, don’t! Submit everything else for validation as early as possible; it will make the process go much more quickly once your scores are reported. Schools set their own deadlines, and some of them might seem far away. But it’s always advised to apply early, primarily because there is less competition early in the season. Also keep in mind that the data you submit to the AMCAS and the AACOMAS has to be verified before it’s even forwarded to the med schools. This takes about six weeks during peak season – more if there’s a problem – so budget that time into your timeline. Sort out your recommendation letters. Hopefully you’ve already contacted the people who you’d like to write letters of evaluation. If not, think about who can write about your suitability for medical school and supply them with an up-to-date CV along with any requests about areas to cover. On the AMCAS, you can have up to ten letters (and pick the schools to which you want each one sent) and they can be submitted at any time. If a recommendation arrives after your application has been verified, it’s sent immediately to your selection of medical schools. After the AMCAS sends your applications to the medical schools you are applying to, you’ll be able to begin submitting secondaries. Some programs automatically send out their secondaries if you select their program; others are sent out by invitation only after your application is reviewed. Heed the “apply early” rule here too – some programs have quick turnarounds, and you don’t want to miss a deadline or get flooded with a lot of new essays all at once. If you applied early in the season, you should start getting interview invitations by late August, and September/November is usually the peak of interview season. If you haven’t heard anything by then, you might consider adding more programs to your school list. Getting your first interview invitation is exciting, but it can also be nerve-wracking. They do get easier with practice, which is why I always recommend you start answering questions in the car, in the shower, while washing dishes, wherever you are. Just be sure you do that practice before, not during, the interview itself. Start worrying, if you need to. What happens if January rolls around and you haven’t heard anything – no interviews, no invited secondaries, just the silent treatment? Chances are you’ll need to start thinking about reapplying. However, there’s still one tactic at your disposal: Sending an appeal letter to the dean of a medical school where you have a real connection can win you an interview or additional review of your application. This should not be done indiscriminately – you need to be able to demonstrate a meaningful connection – but it can work. Don’t put your life on hold while you apply for medical school. Keep doing the things you love doing, whether that’s sports or volunteer work or community activities. Not only will you be a lot happier and a lot less anxious about the whole admissions process, but you’ll also have something to share if and when you get those coveted interviews. If you’re applying to medical school in 2020, this next year could change your life forever. Get started right and stay on top of things, and you’ll be able to make sure it’s an enjoyable as well as a momentous year. 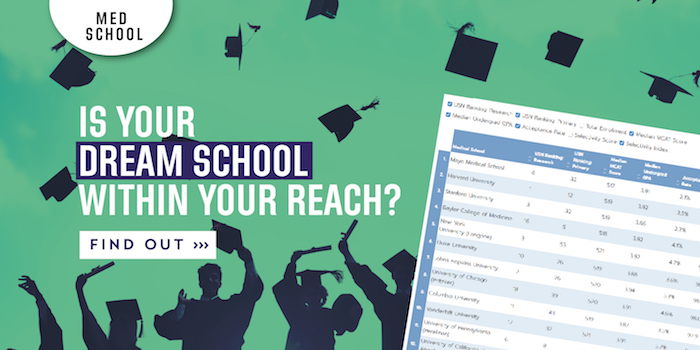 Maximize your chances of getting accepted to medical school by working with a medical school admissions expert who will guide you through acing every step of the application process. Check out our Medical School Admissions Consulting & Editing Services for more information on how we can help you get ACCEPTED.